Oslo's 1349, named after the year the plague hit Norway in the 14th Century, evolved from the demise of ALVHEIM during 1997. The initial line-up, at first utilising the unwieldy title of HOFDINGI MYRKRA, comprised vocalist / drummer Ravn, guitarists Tjalve (a.k.a. André Kvebek) and Balfori and bassist Tor Risdal Stavenes (a.k.a. Seidemann). With initial demo recordings, never publicly released, cut the following year Balfori departed. 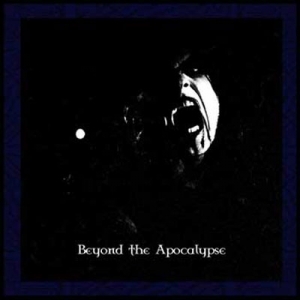 A further tape 'Chaos Preferred' was delivered in August, after which Archaon was inducted as second guitarist. 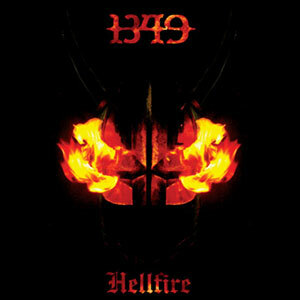 The 2001 EP, succinctly billed as '1349', included a live rendering of Celtic Frost's 'The Usurper'. Stepping on drums would be the revered figure of Satyricon's Frost noted for hist extremely fast drum playing. An album, 'Liberation', was recorded but then shelved as the band split from their label. Ex member Balfori would found Lunaris, a union of Spiral Architect and Satyricon personnel. By December 2002, 1349 had signed a new recording deal with the British Candlelight label. 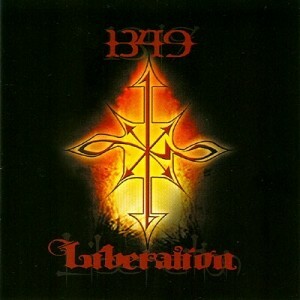 The resulting album, 'Liberation', closed out with a cover version of Mayhem's 'Buried By Time And Dust'. Archaon joined Antaois during February 2003. The band undertook a November European package tour, allied with Aeternus and Red Harvest. 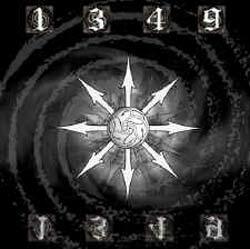 1349 entered Studio Nyhagen in December to record a new album 'Beyond The Apocalypse'. Produced by the band, the record was engineered by Kjartan Hesthagen and Dr. Davidsen. Also on the agenda would be PANTHEON I, a project band of Andrè Kvebek working with guitarist John Espen Sagstad from Abiotic and Sarkom member drummer Eirik Renton. 1349 bassist Seidemann enrolled into the ranks of PANTHEON I in March of 2004. Haraldstad also announced that he had joined another major force on the Norwegian Black Metal scene - Gorgoroth. However, within weeks of this news release the drummer backed out of the union, citing conflicting priorities with Satyricon. Nevertheless, the Gorgoroth connection continued as 1349, promoting the 'Hellfire' album, acted as support to their notorious country mates for European touring in November 2005. In March 2006 the group pulled in the services of former Nile and Dimmu Borgir drummer Tony Laureano for live work as Frost's commitments to Satyricon put him out of contention. Co-founder Tjalve exited in June to focus on his other bands PANTHEON I and Sarkom. 1349 teamed up with Zyklon, Enslaved and Keep of Kalessin for a UK tour in September. US dates followed, sharing the stage with Sahg and Celtic Frost. For these concerts the band utilised the services of Tony Laureano once again. Meantime, Frost sessioned on the tracks 'A Life About My Sabbath' and 'Beneath The Wings Of The Black Vomit Above' featured on the FURZE album 'UTD'. 1349 aligned with Goatwhore, Nachtmystium and Averse Sefira for a North American tour beginning late March 2007.